In November, representatives from NABU, a German based environmental organization, visited New York to take pollution measurements at the Manhattan Cruise Terminal. NABU had been taking these tests at different cruise terminal location around the world, so these New York measurements were going to provide valuable information about the emissions from idling cruise ships berthed at our city's primary terminal. Friends of the Earth, who have been collaborating with NABU, just released the results of these tests in a press release (here). "At each port -- New York, Venice, Italy and Hamburg and Rostok, Germany -- samples taken by NABU with an ultrafine particle counter contained hundreds of thousands of microscopic ultrafine particles of soot per cubic centimeter of air. In New York, the sample contained 201,000 ultrafine particles of soot per cubic centimeter while the cruise ship Norwegian Gem was idling on Nov. 15, 2013." NUBU recorded video of their particle counter taking the measurements in real time as the Norwegian Gem idled at the Manhattan terminal. He stated that, without pollution control technology, such as the use of particle scrubbing or the use of shore power, "cruise ship engines must operate continuously at the dock to keep the lights on, releasing huge quantities of toxic gases that harm public health." "Leif Miller, CEO of NABU, said the World Health Organization considers soot as carcinogenic as asbestos." The release of the results of this study should give those of us who have been calling for the implementation of pollution mitigation practices - such as the use of shore power - at all of our city's ports more impetus to keep doing so. The evidence is clear. These idling ships are pouring out huge quantities of carcinogenic emissions into our city's air and into our residents' lungs, and that is totally unacceptable - especially because it's totally avoidable. "It's unacceptable that some Carnival Corporation ships will be installing state-of-the-art air pollution controls, but not the entire fleet." She states, "It's time for Carnival to stop dragging its feet, not only on the health and safety of its passengers but of people in the ports where it calls. If Carnival cares about people and the planet, the company should install the most health-protective technology on all ships, across all of the lines it operates, to keep the air we breathe clean and healthy." This should be a fleet-wide and port-wide practice. The same goes for the installation of shore power technology. In 2014, the Brooklyn Cruise Terminal in Red Hook is scheduled to become the first port on the East Coast to offer shore power, allowing all of the visiting cruise ships to turn off their engines (that's called cold ironing), and "plug in" to the city's electricity grid while at port, totally eliminating all of those harmful substances we have been discussing and providing great health benefits to the terminal's neighbors and the residents of our city. These measures should be in place at all of our ports - including at container terminals - throughout our region. At the Ports of New York and New Jersey, the third largest port complex in the country, we should be implementing these life saving measures comprehensively - as is being done at the largest ports, the West Coast ports of LA and Long Beach. Just as Carnival is dragging its feet on pollution controls, so is the Port Authority of NY and NJ, which have been absolute laggards in addressing issues of port pollution. They are being left in the dust by their West Coast counterparts - and the residents of our city are being left in the soot! Even if the Port Authority is dawdling on theses matters at our city's major container ports, the next easy step should be the one that is the clear consequence of the findings of the NABU study. The Manhattan Cruise Terminal - operated by the NYC Economic Development Corporation - should be the next terminal to be equipped with shore power technology, as is currently being done at its Brooklyn counterpart. The residents of Manhattan's West Side should no more be inundated by the tons of emissions and carcinogenic particles created by the visiting cruise ships - up to three at a time - idling at the edge of their residential neighborhood. Why should the vulnerable residents of that neighborhood - children, the elderly, people with respiratory illness - be subjected to these harmful substances? 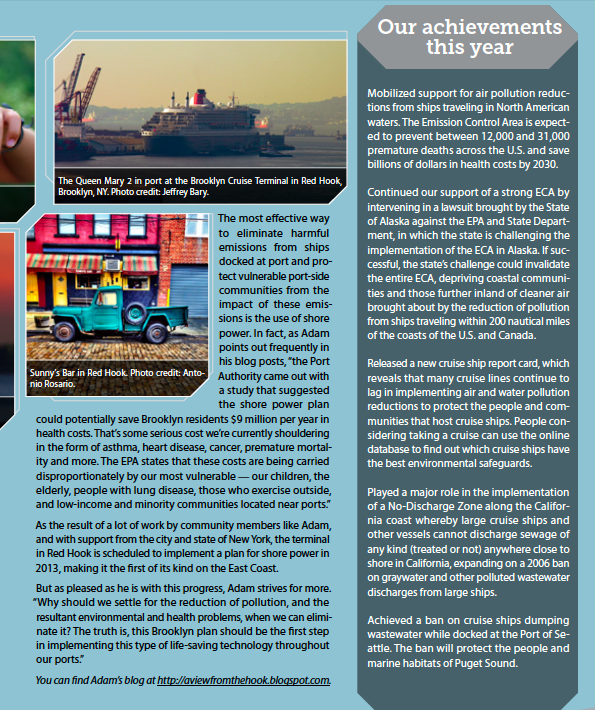 Especially when their fellow New Yorkers, in Red Hook, Brooklyn, who are neighbors to the Brooklyn Cruise Terminal, after years voicing their objection to this practice, have secured a solution - the use of shore power for the cruise ships visiting their neighborhood's terminal. This NABU study should convince us all - the City's "Idle-Free NYC" rule should apply to ships, too - and the cruise ships visiting the Manhattan Cruise Terminal should be the next ones to comply. "The evening will include a series of presentations by designers from around the city who are pushing the envelope and taking resiliency from concept to design. Presenters from the HUD Rebuild By Design Competition, Pratt's RAMP program, and Design Relief will each showcase their work focused on Red Hook." 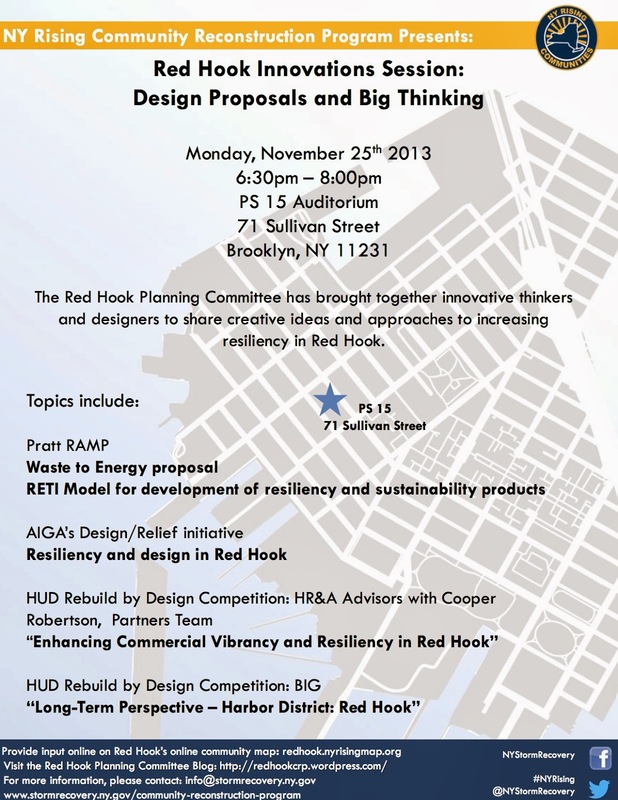 Both BIG and HR&A, who developed plans for the Rebuild By Design competition, will present their ideas for Red Hook. 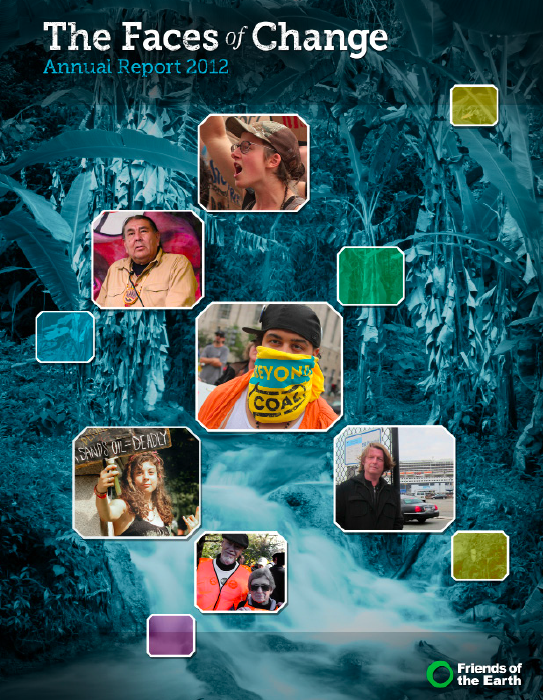 You can view their plans and others at the Rebuild By Design site (HERE). A flyer with all the details is at the bottom of this post. 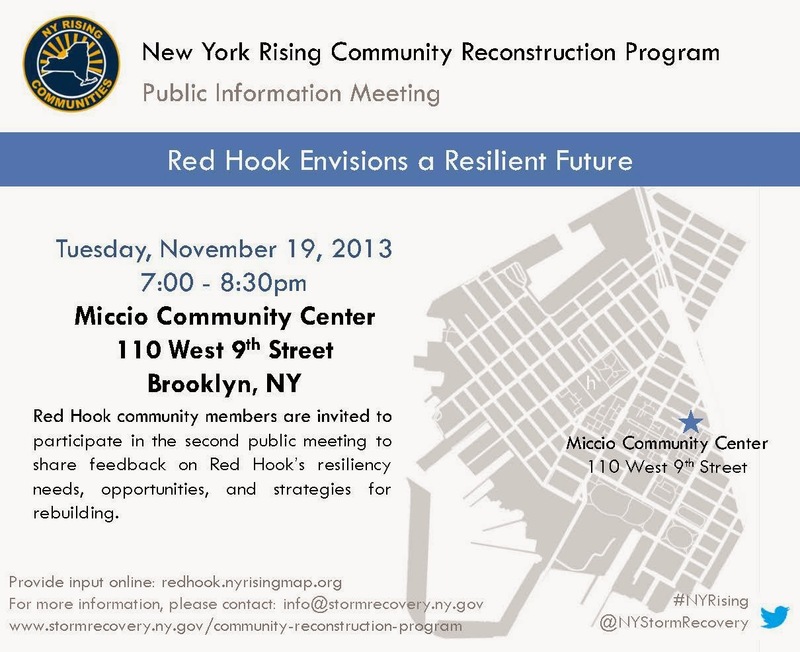 Second Red Hook-Wide Public Meeting for NY Rising Community Reconstruction Program - 7pm, Nov. 19th, 2013 - ALL WELCOME! 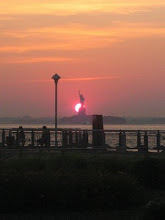 Help Red Hook Strategize for the Future! 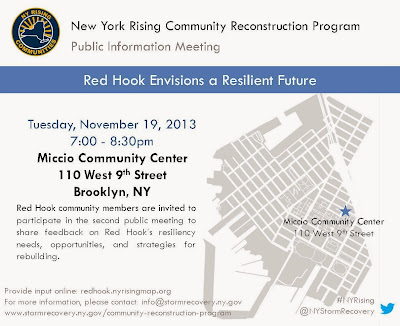 The NY Rising Community Reconstruction Program is holding its second Red Hook neighborhood wide meeting on Tuesday November 19th at 7:00, at the PAL Miccio Center (110 W 9th St, Brooklyn, NY 11231) to help shape the future of resiliency in Red Hook. There is the opportunity to provide additional input on this interactive map - http://redhook.nyrisingmap.org/page/about - where you can add your detailed ideas on the shape of Red Hook's future. The next step is to create a set of Strategies, linked to our Needs and Opportunities. 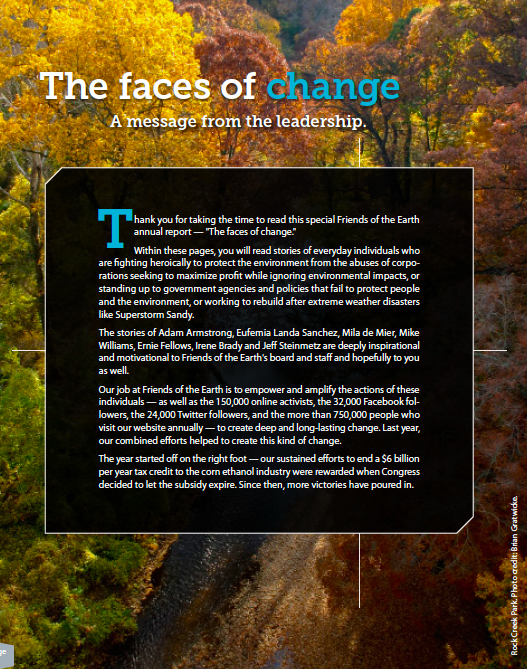 These Strategies will lead to specific projects to help us reach our resilient community goals. Identifying these Strategies is critical to laying the foundation. We need your voice and input. The event on November 19th will be a series of round table discussions so we can talk, neighbor to neighbor about our visions, ideas, and consider our neighborhood's future reconstruction. Pioneer Street - courtesy of the SSAIL Facebook Page. Red Hook residents are extremely concerned about the affordability of flood insurance for their homes. Anyone who attended the public meeting last week for the NY Rising Community Reconstruction Plan heard that concern stated over and over again, with many attendees saying it was one of the most important issues for Red Hook home-owners who are worried about the future affordability and viability of living in Red Hook. As we know, after the destruction and upheaval that Superstorm Sandy caused, Red Hook residents struggled with getting fair compensation from their flood insurance companies for the damages they suffered. Some home-owners, nearly 12 months after the storm, are still waiting for satisfaction and are caught in a long-term legal fight to get that much needed (and deserved) payout. Now, adding insult to injury, changes that were made to the National Flood Insurance Program (NFIP) by Congress via the Biggert-Waters Act of 2012 (pre-Sandy) are making the renewal or purchase of flood insurance much more expensive - by a factor 60 in some cases (quotes of $36,000/year) - regardless of any reasonable measures that the home-owner might have made to protect or reduce potential damage to their homes from future flooding (raising mechanicals to upper floors, elevating electric meters, etc.). These coming increases will restrict the community's ability to insure their properties; force residents out of their homes; drive down property values and affordability; and will have flow-on effects that may prove even more harmful to Red Hook's residential and commercial community than the storm itself. The fact is, if these increased costs do become insurmountable, this would have an enormous impact on the resilience and successful post-Sandy recovery of the neighborhood, which so many of us are working towards. It would be a disaster. 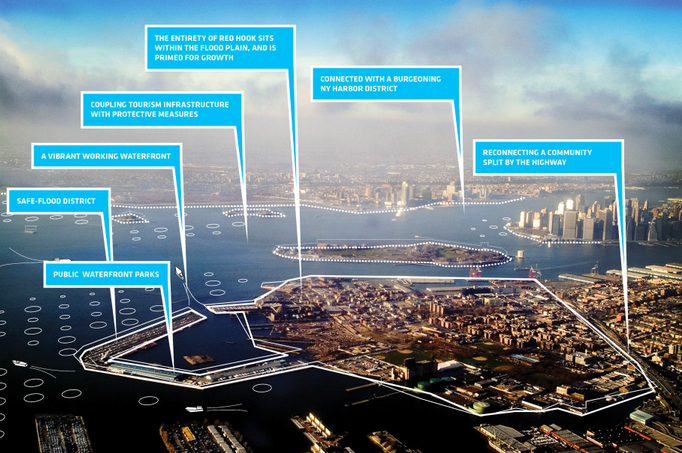 This is what Red Hook residents are so worried about. To raise awareness of this issue, Red Hook home-owners have banded together to start a group called "Sandy Survivors for Affordable Insurance Legislation - SSAIL" (Facebook page here which has links to many stories on this subject). Additionally, a letter has been composed by residents of Pioneer Street (full disclosure: my street), in which they detail the terrible impact that the Biggert-Waters Act will have on the people living on this particular Red Hook street - impacts that will similarly be borne throughout the neighborhood. I could outline the many arguments that are being made for rolling back this destructive law, but it's probably best if the reader takes a look at the points these Pioneer Street residents have compiled in the letter. It's pretty compelling. The letter will be presented to the House Financial Services Committee by an organization called Coalition for Sustainable Flood Insurance (CSI), which is representing many communities around the country that are being impacted negatively by the changes made by the Biggert-Waters Act. The historic Brooklyn neighborhood of Red Hook, in New York City is home to many working and middle‐class families who have lived here for generations, as well as artists and small businesses which have contributed to the recent revitalization of this diverse waterfront community. Pioneer Street is one of the few preserved blocks in the neighborhood, comprised of nearly forty late 19th century brick row houses. These small, three‐story buildings, each between only 1500 and 1800 square feet, are mostly primary residences. Many also include a rental unit on one floor, and this income helps keep the neighborhood affordable by reducing the expenses of home‐ownership in New York City. In turn, this affordability helps keep property values in the neighborhood stable. Pioneer street itself is approximately seven and a half feet above sea level, and even though it is located well inside New York Harbor, and not subject to any wave action or moving water, the flooding that resulted from Super Storm Sandy did inundate the lowest, “garden-­‐level” floors of all of our homes, which are a few steps down from the street. This was the first flooding of this kind in well over 100 years, if ever. The damage from this stillwater flooding was significant, but not crippling. Mostly, it was mechanical equipment, electrical service, insulation and finishes that needed repair. Only a few homes had any structural damages, and this was typically minor. Almost all of these homes were fully repaired within six months, and most homeowners were able to continue to live in their homes during the repairs. Although the storm was devastating, its effects were relatively short-­‐lived. This will not be the case with the Biggert‐Waters Flood Reform Act, which threatens long­‐term and irreversible damage to our homes, our neighborhood, and our community. This so‐called reform act, which was passed months before Sandy, calls for dramatic and unprecedented increases in flood insurance premiums for policies administered through the National Flood Insurance Program (NFIP). These premiums will be set primarily according to the elevation of a home relative to a base flood elevation, which is approximately twelve feet above sea level on Pioneer Street, regardless of when the homes were actually constructed. This is a departure from the previous regulation, which did distinguish between pre‐existing houses and new developments. 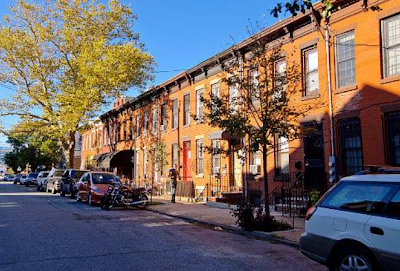 As a result, Red Hook homeowners may see premiums rise as much as sixty times their current rates, from as little as $1,600 per year to as much as $36,000. According to FEMA, the only way to afford these crippling rates would be to literally raise our homes by as much as 8 feet. The 19th Century, joisted­‐masonry construction of our houses makes them impossible to elevate. In order to avoid these new premiums, our only option would be to tear down our entire block – forty Civil War Era houses – and rebuild from scratch, which is not financially feasible for any of us because like most Americans, most of our net worth is in our homes, and subject to mortgages which we work very hard to pay off. 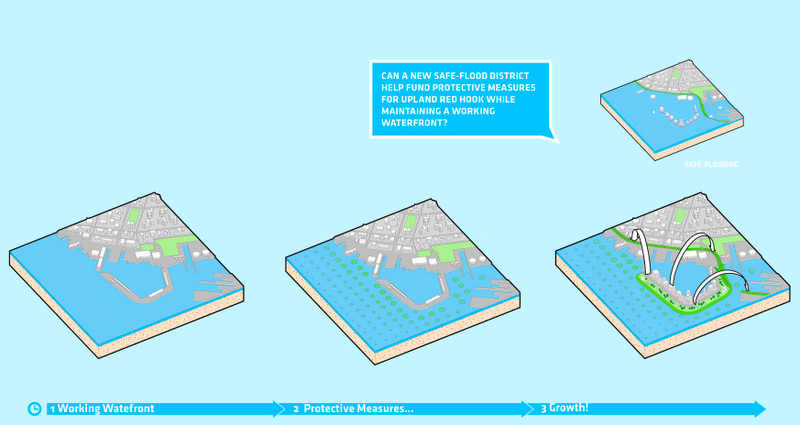 Our intimate knowledge with the flooding caused by Sandy, and our associated experience filing flood insurance claims through the NFIP, uniquely qualifies us to evaluate the proposed changes to this program. To be blunt, we are confused as to how the new, unsubsidized premiums can be justified as "actuarial". These yearly premiums represent, on average, somewhere between 33% and 200% of the actual settlements paid out by the NFIP to Red Hook policy‐holders following Sandy. This for an event with a probability of occurrence of 1/100, according to FEMA’s own flood maps (in truth, Sandy is likely the worst flood in 500 years of recorded NYC history, arguably making it less likely). Even if we were to assume that the frequency of these events will increase twofold over the next fifty years, and factor in generous allowances for overhead and administration, the numbers don't come close to adding up. In fact, the premiums would be unjustifiable even if these policies had paid out 100% of their value ($250k) following Sandy, which they did not. No rational homeowner would participate in this program at these rates, since it would be vastly cheaper to self‐insure. This will deplete the insurance pool, leading to more deficits for the NFIP. In addition, those of us who are required by their mortgagees to carry such insurance will be caught between a rock and hard place; unable to afford their homes as result of these crippling flood insurance premiums, yet also underwater on their mortgages and unable to sell and relocate because of the effect mandatory insurance at unjustifiable prices will have on property values. Fortunately, there are many alternatives to Biggert‐Waters’ “reforms” which can improve the solvency of the NFIP without victimizing homeowners. A team of New York City experts under the Special Initiative for Rebuilding and Resiliency (SIRR) proposed several such alternatives. For example, offering homeowners the option of lower cost, high deductible policies would help mitigate some of the severe affordability issues that Biggert‐Waters threatens, would continue to protect homeowners from catastrophic loss, and would ease future demands on the NFIP by reducing smaller, non‐catastrophic repetitive claims. Similarly, the NFIP could offer credits – substantial enough to serve as an effective incentive – against insurance premiums for proven flood design improvements, such as elevating sensitive equipment and electrical service, avoiding the use of permeable construction materials like BATT insulation or drywall, and employing flood vents to equalize hydrostatic pressure across structural walls in the event of severe flooding to prevent serious structural damage. These design improvements alone would have reduced the Sandy flood damage experienced in Red Hook by upwards of 66% for most properties. Biggert‐Waters tries to balance the flawed design of the NFIP on the backs of innocent, hardworking homeowners in neighborhoods such as ours. This is an outrage, especially because so many good alternatives exist. Biggert‐Waters needs immediate and dramatic reform along with an affordability study that accurately reflects the repercussions the removal of these subsidies will have on average working class Americans. We implore you to get to work. Red Hook's Congresswoman Nydia Velázquez (NY-7) joined Congresswoman Carolyn Maloney (NY-12), New York City property owners, co-op residents, insurance experts, small-business owners and community advocates today outside 200 East End Avenue, an Upper East Side co-op building that, after recouping from $4 million of damage after Hurricane Sandy, could be hit with sky-high flood insurance premiums through the National Flood Insurance Program, as a result of the the Flood Insurance Reform Act of 2012. Other attendees from around New York City are also facing the reality of soaring flood insurance premiums that are unaffordable and could prevent people from purchasing insurance. Congresswoman Maloney called for a delay in the rate increases, many of which took effect on Oct. 1, and could raise New Yorker’s premiums by $5,000-$10,000, according to a recent City report. “The flood insurance program should not harm New Yorkers with unreasonable rate increases. We must work together to find a solution that protects New Yorkers in high-risk flood areas,” said Congresswoman Velázquez. Photo Caption: Congresswoman Maloney (NY-12) (center), is joined by Congresswoman Velazquez (NY-7), homeowners, advocates and community members from Manhattan, Brooklyn and Queens to call on Congress to delay drastic increases in premiums for flood insurance through the National Flood Insurance Program. "The Number of Families Required to Pay for Federal Flood Insurance will Double When New FEMA Maps are Complete; Congress and FEMA Must Ensure that Coverage Is Not Cost Prohibitive"
New York, NY – Congresswoman Carolyn Maloney (NY-12) will be joined by New York City residents, members of the insurance industry, community advocates and small-business owners on Sunday, Oct. 27, 12 noon, in front of 200 East End Avenue, between 89th and 90th Streets, in Manhattan, to highlight the fact that many property owners are facing drastically high increases in their federal flood insurance premiums, as a result of the Biggert-Waters Flood Insurance Reform Act. 200 East End Avenue is a Co-Op building that suffered millions of dollars of damage in Hurricane Sandy. But, as a result of Biggert-Waters, it could see an unaffordable increase in premium rates for flood insurance through the National Flood Insurance Program (NFIP). "The number of properties in New York City that will be required to have federal flood insurance will nearly double in 2015, and the accompanying higher premiums may mean that many city residents will have to relocate, Mayor Michael R. Bloomberg said on Friday." This week, New York added a new cruise ship to the list of vessels calling our city's ports home. That ship is the "Norwegian Breakaway", which is the largest cruise ship to homeport in Manhattan. (The largest cruise ship that homeports in NYC - the Queen Mary 2 - berths at the Brooklyn Cruise Terminal in Red Hook). Mayor Bloomberg, New York Cruise and the New York City Economic Development Corporation were all abuzz about the arrival of this ship and its imminent "christening". This week, NYCEDC and Mayor Bloomberg joined Norwegian Cruise Line and the Rockettes to christen the Norwegian Breakaway, the largest cruise ship ever to port in NYC! The enormous 4,000-passenger vessel with Peter Max’s signature artwork on its hull was a sight to behold at the Manhattan Cruise Terminal at Pier 88. 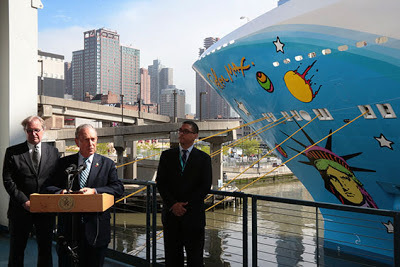 “The arrival of the Norwegian Breakaway—the largest cruise ship to homeport in Manhattan—is another proof point of the growth and success of New York City’s $200 million cruise sector, a cornerstone of the City’s $55 billion tourism industry,” said Mayor Bloomberg. 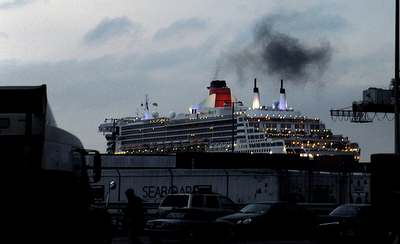 The City and NYCEDC are always talking about the economic benefits of the cruise industry, but never talk about the economic and environmental impact of this industry - due to pollution, health impacts, and other factors. (Not to mention the fact that the cruise industry has a pretty poor record regarding labor law and in paying taxes. For example, over the past 5 years, Carnival paid only 1.1% in tax). Are your readers aware that these huge ships - like all ocean-going ships that visit the ports of New York (cruise, container and cargo) - are constantly idling while in port? While they berth at our city's terminals, often next to our most dense residential neighborhoods, they are continuously running their dirty diesel engines to supply the ship's electrical needs. The emissions that these ships' engines create while in port - equivalent to up to 30,000 cars - are high in sulfur and soot and the EPA regards them to be carcinogenic and asthma inducing, among their various well-documented negative health impacts. These impacts, says the EPA, are most acutely shouldered by our most vulnerable - our children, people with respiratory ailments (like asthma), the elderly and low income or minority communities. As toxic as they are, there is a way to stop these harmful substances being emitted while the ships are in port. That is to "plug-in" the ships to the city's electric grid - using what is called "shore power" - thereby allowing the ships to turn off their dirty diesel engines while in port (this is a practice called "cold ironing"). Despite the fact that this practice has been used widely in many places - like on the West Coast (Ports of LA, Long Beach, etc.) - and has been used by the US Navy for over 50 years, East Coast ports have not one single port with "shore power" in use. 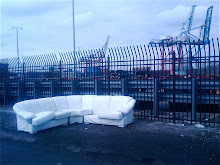 (Brooklyn Cruise Terminal in New York is supposed to be the first on the East Coast to do so in 2014 - after a long fought effort by the community to make it happen - but no infrastructure has yet been built, and until it is up and running, no one is counting that chicken). The Ports of NY and NJ make up the third largest port complex in the nation - behind the West Coast ports I mentioned. Compared to the actions taken by the mayors, etc. of those West Coast cities, why hasn't the administration of this city taken the emissions of these ships seriously, especially when there is a way to actually eliminate those emissions - one that is tried and proven in those other port cities? Yes, the cruise industry and shipping industry is having a positive impact on our city's economy, but without these pollution mitigating technologies, there is a tremendous price being paid - often unknowingly - by our port-side residents. Are the residents of the West Side of Manhattan even aware that these huge ships - sometimes 3 at a time - are all idling while berthed at the edge of their neighborhood, spewing fumes over their heads and into their children's lungs? Why don't they know? Isn't it the City's obligation to educate these residents about the poisons that are being injected by these ships into their air? The fact is, the City never acknowledges the burden that is being shouldered by our city's residents in negative health impacts due to the emissions of ships and other port activities. 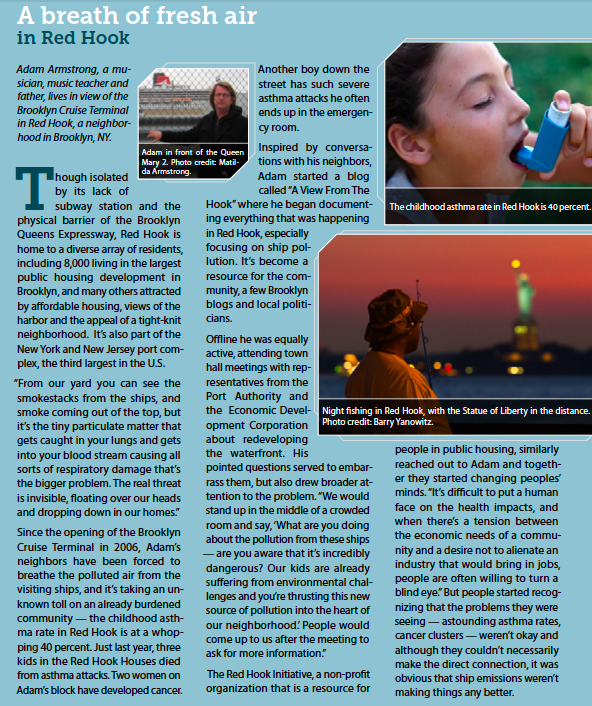 The City and NYCEDC are constantly touting the economic benefits of our cruise industry, but never a mention of any of the negative impacts - on our health and environment. For an administration that prides itself on its "green" credentials, that is shameful. History will not look kindly on the inaction of Mayor Bloomberg, the NYCEDC and the Port Authority of New York and New Jersey in tackling the impact of port emissions over the last 10 years. There's still time to do something, but the record - as of now - is a pretty sorry one. Ship and Bunker: "Millions of Dollars Being Spent on Shore Side Power"
Maritime Executive: "Long Beach: Port, Terminals, Ships Investing in Shore Power"